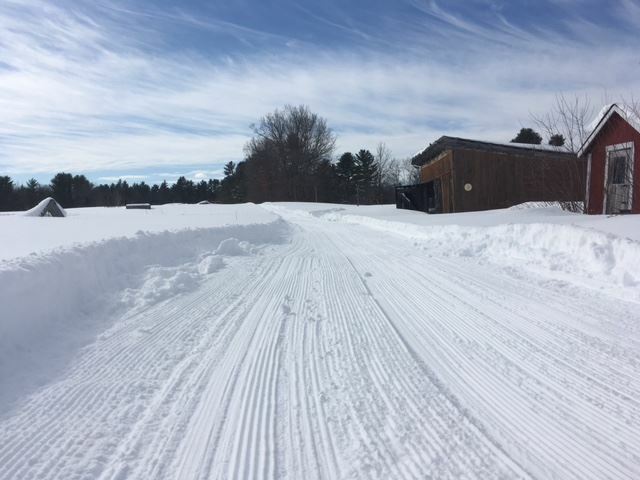 The Carter's XC Ski Center in Bethel, Maine has beautiful views of the Mahoosuc and Presidential mountain ranges, and the land has been in the Carter family for generations. Fat bike trails and rentals are now available and the retail shop is stocked with XC skis for recreational, racing and backcountry skiing and snowshoes. The trails are open from 9:00 AM - 5:00 PM. Trail passes are $15 per day for adults, $10 for students aged 7-18 and senior citizens, and kids under 6 years old ski free. Carter's XC Ski Center in Bethel is on 1,000 acres and has 55 km of groomed trails and 4 lodges. The Willow Brook Lodge can accommodate a family of group up to 8 people. There are 3 bedrooms and 4 baths, a full kitchen, living area, fireplace, and appliances. The lodge rents for $275 per night for up to 6 guests. A single room in the lodge is available for 2 guests for $99. Each additional guest is $30 per night. Camp Fern is a cabin, which has a wood stove and sleeps up to 8. Overnight accommodations are $99 for 2 guests and $30 for each additional guest. The Bethel site also has the Farwell Mountain Cabin, the renovated Grafton Notch Cabin, and the most recently constructed Stonewall. There is rental equipment for xc ski, snowshoeing and backcountry, race skiing, and fat biking. Rentals area $15 for a xc ski package and $10 for kids under 5 feet. Snowshoes rent for $15. Backcountry and racing rental gear is more. Fat bike rentals are $25. Demo equipment is on hand and there are pulk sleds to take babies or toddlers on the trails with you. Ski instruction is available for $15 in group lessons or $60 for private Learn to Ski package that includes rental equipment and trail pass with the lesson. A private lesson is $39 for an individual. Directions: Take I-95 to north of Portland and take Route 26 to Bethel, which is 63 miles from Portland on Route 26. From NH take Route 2 east to Bethel.